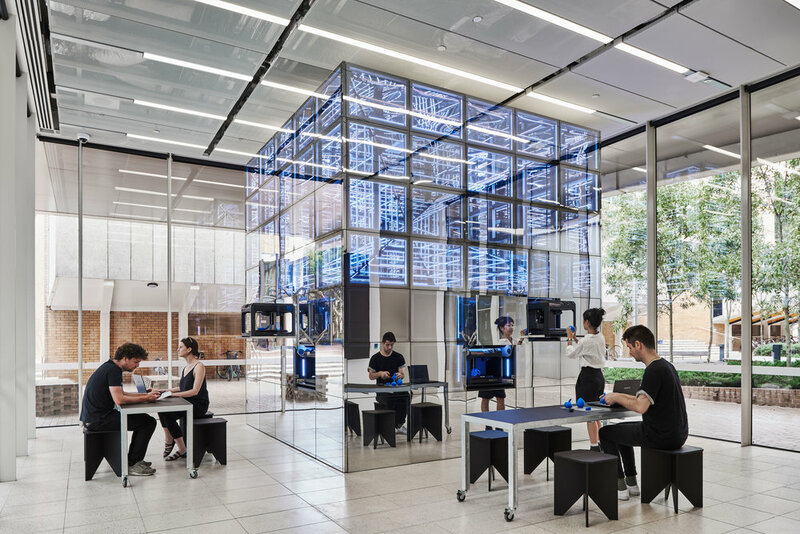 The New Experimental Technology Lab, at the University of Melbourne’s Melbourne School of Design, is a digital makerspace, a new kind of workshop designed around the idea that innovation occurs through the freedom to experience, experiment and explore. The space integrates a 3D printing farm of 32 printers, augmented and virtual reality environments, 3D scanning technology, and a programmable interactive LED installation, as well as room to run studios, seminars and support sessions, allowing people to experience and collaborate on new platforms. Importantly the lab is designed to not only provide a space to work, but also access to a consciously nurtured culture of innovation. The site is highly visible, enclosed within glass walls and flanked by busy pedestrian thoroughfares in the heart of the university campus. 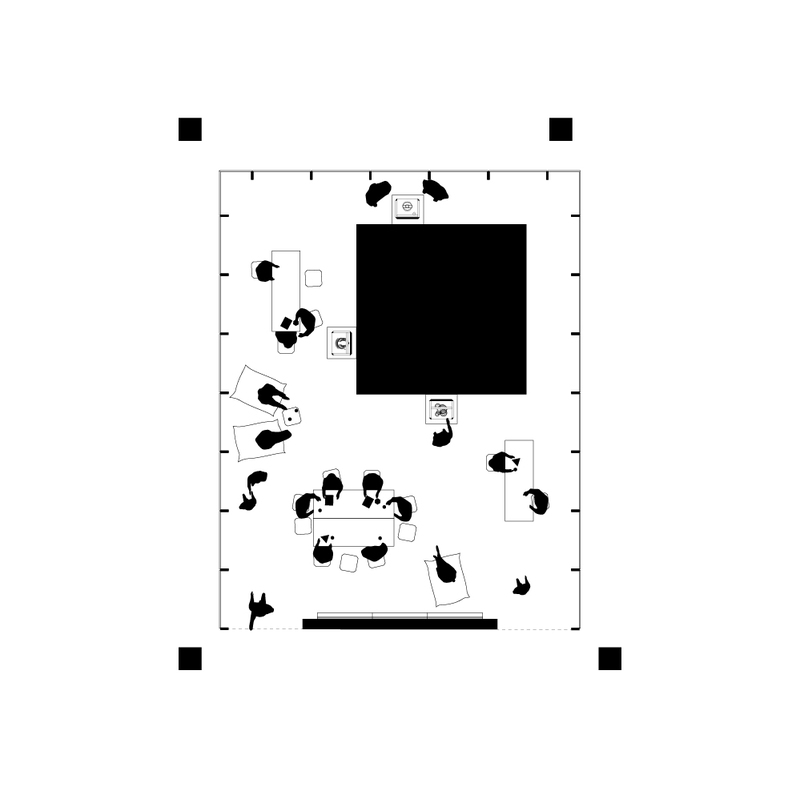 This presented an opportunity rethink the idea of what a workshop is, typically tucked-away to conceal the messiness with exclusive, defined barriers controlling access, visibility and participation. In contrast the NExT Lab is open to everyone and always on display. It is designed to be dynamic, surprising and even playful, drawing attention in an unexpected way to the purpose of the space and engaging with a wider audience within and beyond the Melbourne School of Design. A reductive mirrored box housing a large range of equipment and furniture is anchored in the middle of the space, keeping all edges open and sociable. 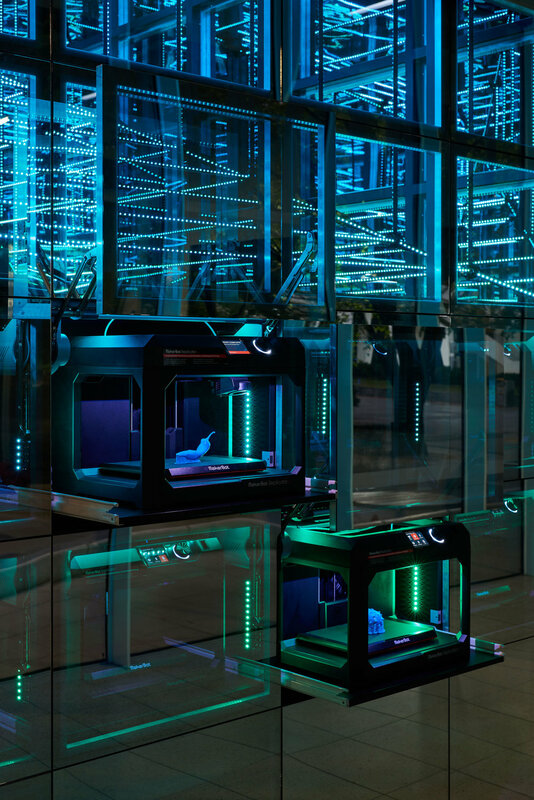 3D printers are arranged on each face of the cube allowing unobstructed views from every angle. 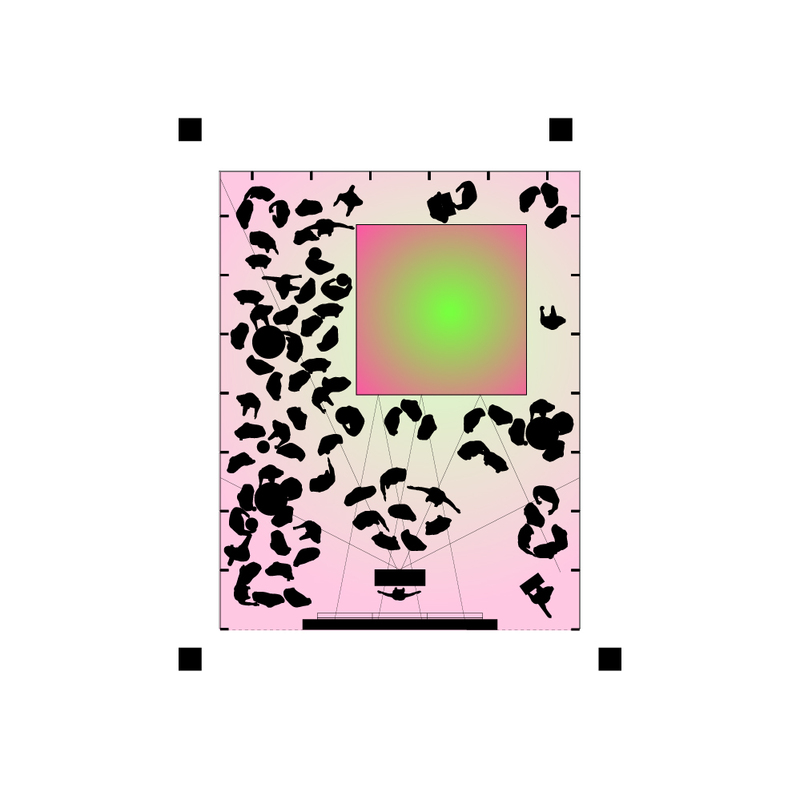 Access to an adjacent café encourages patrons to spill over and appropriate the workshop while floor-to-ceiling mirrors coupled with a video wall and large interactive LED installation animate the interior, further attributing to the space’s extroversion. 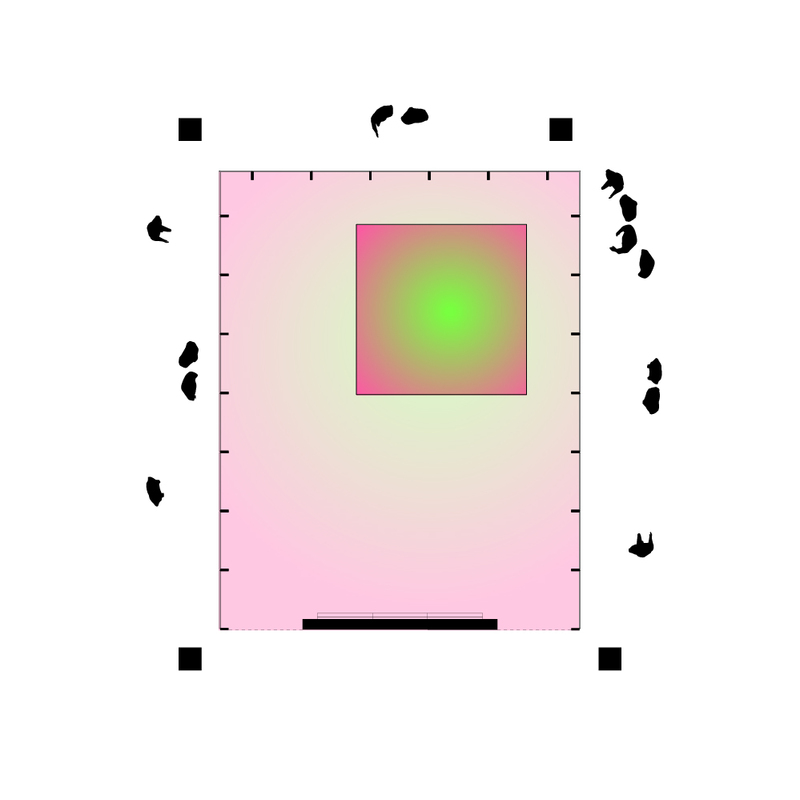 The cube is deliberately restrained and almost monolithic, a stand-alone object to behold. 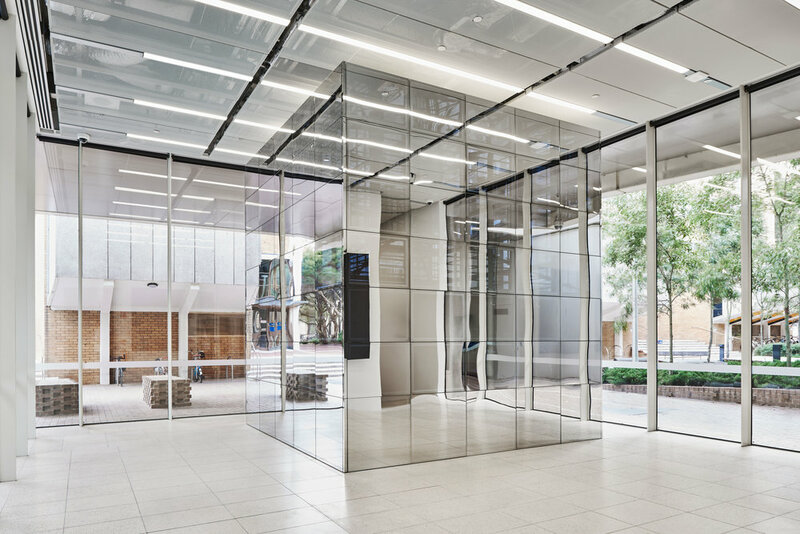 Clad in 2-way mirror, it performs the visual trick of giving a solid reflective mass externally, and then when lit internally, it displays a glowing veil of translucency that hints at what is within. 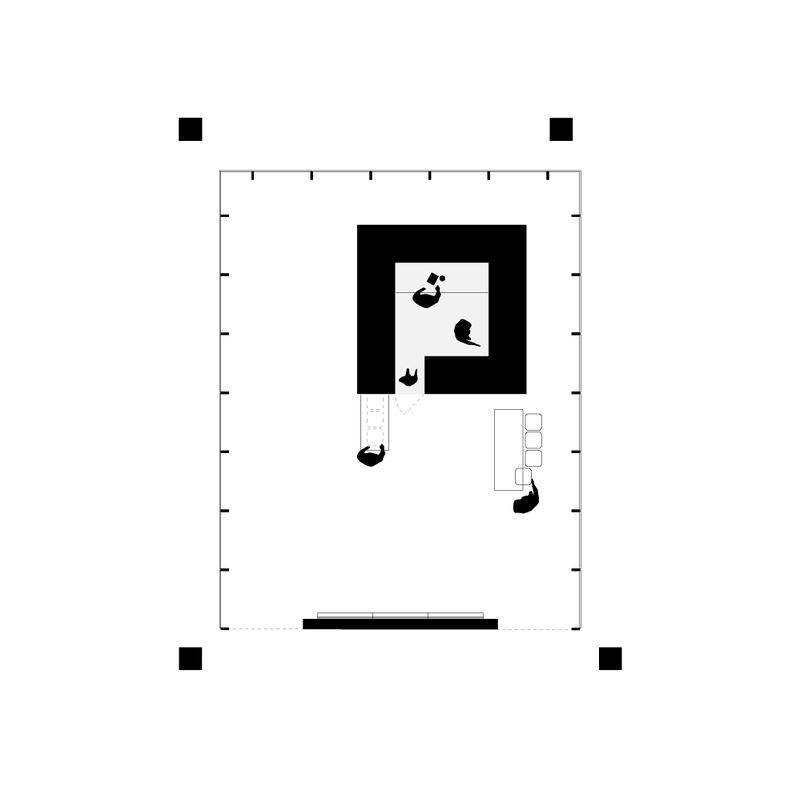 This duality reverses itself at night, with rows upon rows of equipment clearly lit and neatly displayed, akin to a gallery, providing yet another reading of spatial transparency. 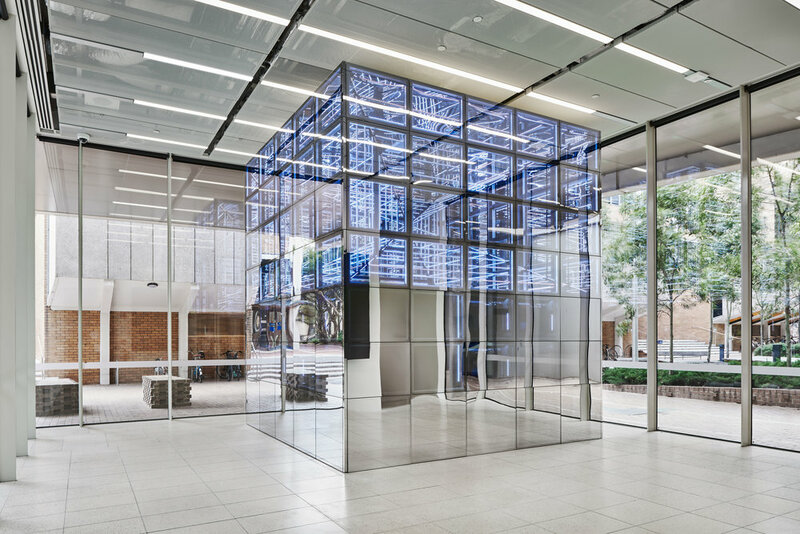 The cube’s contents are packed away seamlessly behind this grid of mirrors that lift, pop up and swing open to reveal equipment, furniture and controls. Storage, fume extractions and additional fire systems are also integrated within the cube to keep the space as open and uncluttered as possible. Hosting multiple functions over a single day, the cube is designed as a crafted piece of adaptable joinery to allow for easy reconfiguration to suit each purpose and to conveniently and quickly pack away. This transformative nature allows for a range of spatial experiences but is also an act of storytelling. The shifting transparencies and boundaries are a gesture for more open, inclusive and adaptable maker spaces, as well as many more curious minds. Architects: Ample Architecture in collaboration with University Architect, Project Services, University of Melbourne.